The series covers several different measuring ranges and scanning angles resulting in a choice of different resolutions. 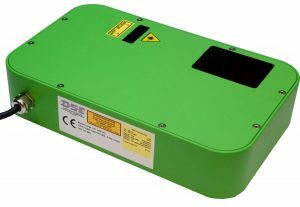 The O2DS Z series is laser scanners of the Flying Spot type developed for the need of 2D profile measurement in any kind of industrial application. The ruggedly constructed scanners are designed to give a very reliable measuring performance with high measuring accuracy. Small scan angels and/or high measuring frequencies create very high angular resolutions. Another advantage of the Flying Spot principle is the use of a single spot instead of a laser line. The intensity of the laser light is furthermore continuously adapted by feed back to the optimal intensity for the surface of the application. The measurement is performed by oscillating the triangulation plane over an angel. The angel can be specified to a maximum of 50°. A fine collimated or focused laser beam is diffusely reflected from the surface of almost any kind of object, and a CCD-camera records the image through an objective. This makes it possible for a Digital Signal Processor to precisely determine the radial distance from the centre of the mirror axis to the surface of the target, as well as keeping track of the angular reference position. The O2DS Z covers 8 different measuring ranges. The smallest is 100 mm, measuring from 200 to 300 mm and the largest is 1.300mm, measuring from 700 to 2.000 mm. The resolution varies from 0.03 mm to 0.8 mm. The smaller the measuring range is, the better the resolution will be. O2DS Z models are available with measuring frequencies of 2 kHz or 6 kHz. The O2DS Z is a compact unit where optics, CCD-camera, and digital electronics all are integrated. There is no need for a separate controller unit. The output is a serial interface RS422. For the 2 kHz O2DS also RS232 is available. The actual interface to the application software is a DLL library for programs running under Windows. For dual or more purpose the O2DS Z scanners are also available in a synchronized version, where the units are programmed to operate as either a slave unit or as a master unit controlling one or more slave units. Synchronization: As a rather unique feature the O2DS Z-Scanner is available in synchronized versions where two or more units works together to perform complex 2D/geometric measurements. The working principle is one master scanner unit together with one or more slave units – as for example, when four units controls dimensions and shape in tube- or similar productions process. Distance measurement on target with High Temperature. To meet this demands, the O2DS family can be modified into High Temperature version to reach different levels of temperature, basically named HT, VHT and VVHT. As a rather unique feature the VVHT version are capable of measuring on extreme hot target surfaces up to 2.200ºC. The applications where the O2DS Z-Scanner family can be used are innumerable. From Steel-, metal and construction industry to food and car production – everywhere a non-contact precision profile scanning is advantageous. Measuring volume of cheese before it is cut out in segment and equal weight. Measuring side profiles of aluminum slabs. Measuring height of large steel slabs instead of thickness from above and below.